David Collier, the ECB chief executive, has claimed that members of the South Africa squad "provoked" Kevin Pietersen into the exchange of messages that led to him being dropped by England earlier this summer. Last week, the ECB announced a process of "reintegration" for Pietersen following his exile from the team during the summer after it was revealed he had sent provocative messages to the South Africans. Initially it was claimed these included tactical advice on how to dismiss Andrew Strauss although this has since been denied. Speaking for the first time about the issue, Collier said the belief was that it was instigated by the South Africans as a tactic to unsettle Pietersen. "That's our understanding," he told BBC Radio Five Live's Sportsweek programme. "It is a very thin line between fair and unfair. These were responses to messages from certain members of the South Africa team and I would not condone an England player doing it if it was the other way around, and I certainly think they provoked the situation." However, Collier added that the situation should have been handled better within the dressing room. "There was definitely a policy that was happening but we shouldn't blame the South Africans, we should be above that," he said. "I think there was a tactic which was used. I think that is sadly some of the ways of modern sport but as I say we have plenty of people who are strong in the dressing room who provide very good leadership who can deal with those situations." Collier said he had not seen the Blackberry messages at the centre of the controversy - and no evidence of them is believed to remain - but that it was an attempt to disrupt the team ethic. "Those messages were of a nature that Kevin, with definite hindsight, would have refuted straight away and moved on. It is trying to undermine another team and another team ethic." Cricket South Africa described the messages as "banter" when the story first emerged in August and a representative of CSA denied Collier's new claims: "That is rubbish. That is not the case at all. No one was trying to rile KP." Pietersen has not played for England since the second Test against South Africa at Headingley, where he scored 149 and followed it with a press conference where he hinted at a split in the dressing room. The process has now started to bring him back into the fold, possibly for the Test series against India which starts next month, while a series of meetings are due to be held between Pietersen and senior England players in the coming weeks. 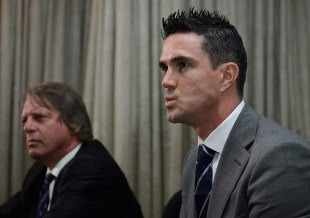 The final decision of when Pietersen is recalled now rests in the hands of Andy Flower, the team director, who admitted it "hadn't been a great couple of months". Pietersen is due to fly back from the Champions League T20 for discussions ahead of England's training camp in Dubai in a couple of week's time and Collier has complete trust in Flower's judgement. "When Andy Flower says to me 'I am ready to select this player' I would trust his judgement every single time. If the team director says he is ready, that is good enough for me," Collier said. "It takes two seconds to destroy a building and it takes a long time to build it, it is the same with trust therefore we have to have face-to-face meetings. "We have an Ashes series and we don't want a divided dressing room, we want to make sure we can move collectively. People can't build relationships without meetings - that is the starting point. They will happen this month and Giles Clarke met Kevin earlier this week. "The meeting had this week was described by both sides as cordial - direct but cordial. It is important to be honest and say our concerns and allow Kevin to say what his concerns were."